Hello! 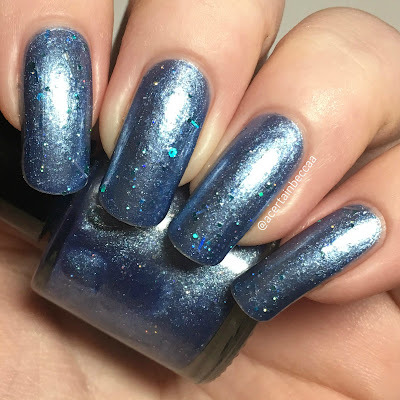 Today I'm back with more swatches from new indie brand OccasioNail. If you missed my previous posts, you can find the first half of the Winter 2017 collection here, and the February polish of the month 'Lagoon' here. I have seven polishes in total to show you, so this could get fairly long. Read on for full swatches and more info! First up I have the second half of the Winter 2017 collection. 'Stawberry Jam' is a sheer pink jelly base full of small black circles and hexes, medium pink and red hexes, and medium holographic silver hexes. This can be built up on it's own but also works well as a topper. I decided to use it over a pink creme similar to the base colour. You get a lot of glitter out on the brush, and it spreads out evenly without much manipulation. This really does remind me of Strawberry Jam. Below is one coat and topcoat over a hot pink. 'Orange You Glad It Isn't Red' is a rich deep orange. This has more of a jelly formula so applies quite sheer at first, although perfectly evenly. It is very smooth and easy to apply, and builds up nicely. 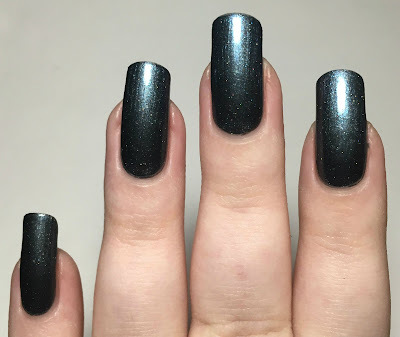 I found it to be opaque in three coats. Being a jelly it also dries gorgeously smooth and glossy. 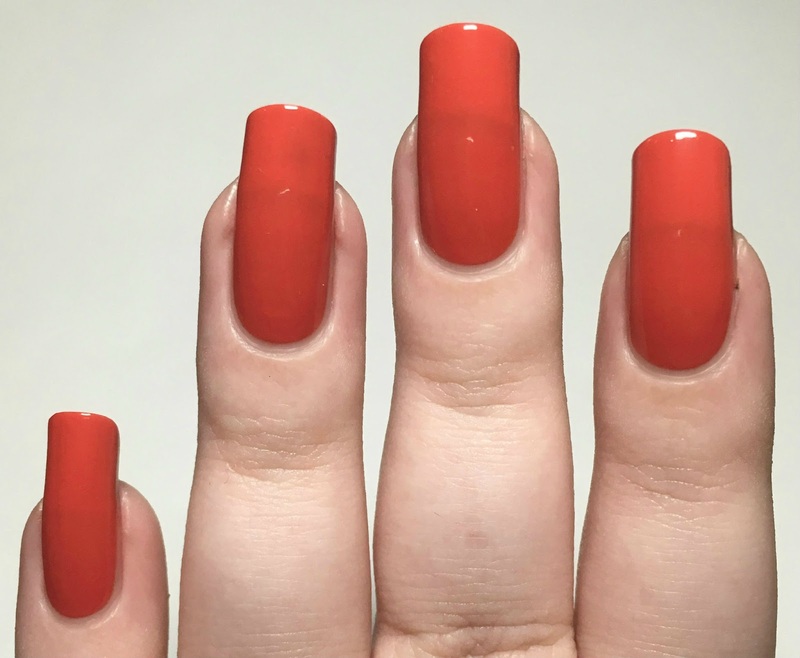 I just love orange polish. Below is three coats without topcoat. 'Frost' is a metallic frosty blue with holographic microglitter, hexes, and bars. This one is a bit sheer so does take three coats to be opaque. You get a good amount of glitters out - enough that you don't have to fish, but not so many it makes application thick. 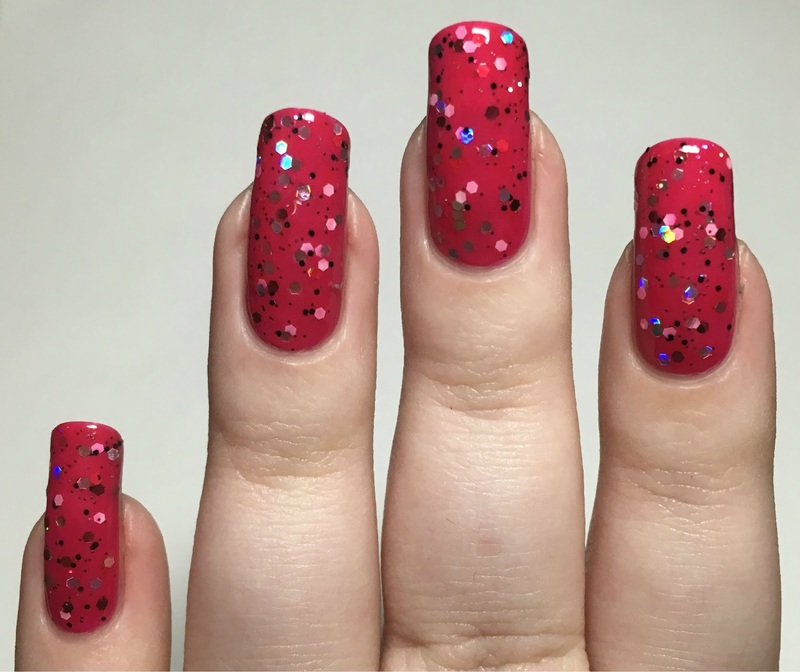 The glitters lay flat on the nail and are easily smoothed with a coat of topcoat. Below is three coats with topcoat. The rest are from various collections, or are pre-launch polishes. 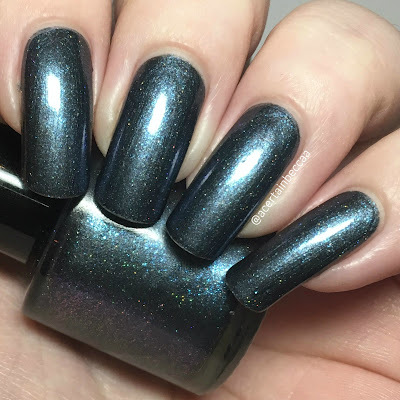 'Denim Days' is a deep grey with blue shimmer and fine holographic glitter. Again this has a lovely formula. It is a little bit sheer patchy on the first coat, but easily covers completely with two. 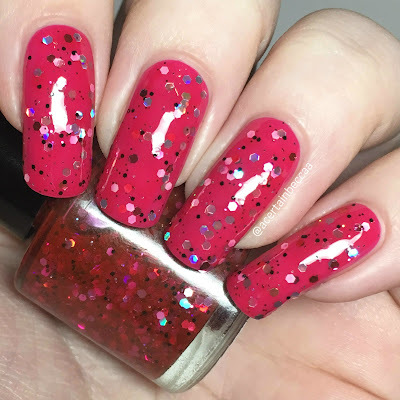 The holographic glitter is so fine that it doesn't cause any texture, although I would recommend topcoat to help the shimmer pop. This definitely looks like denim. Below is two coats and topcoat. 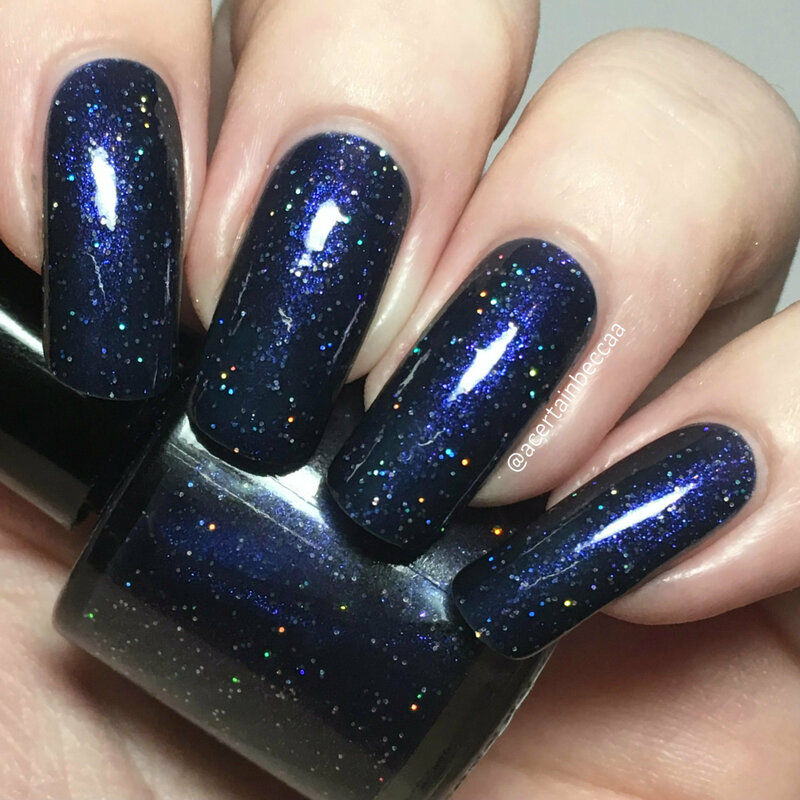 'Midnight Walk' is a deep bluey purple base full of purple shimmer and small holographic silver circles. It is smooth and easy to apply but sheer on the first coat. It builds up to be fully opaque after three. You could also use it as a topper over black or something dark. This dries down dull and also slightly textured from the glitters, so I would definitely recommend topcoating. 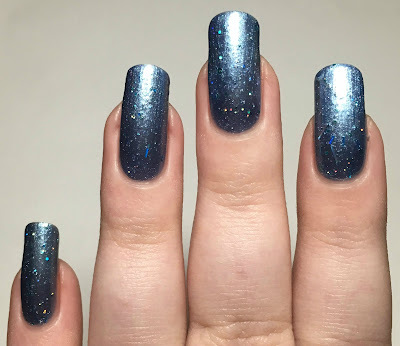 This would be perfect for a galaxy mani. Below is three coats and topcoat. 'Purple Panther' is a bright purple base with translucent white flakes and tiny holographic glitter. The formula is really smooth and doesn't feel thick from the flakies. It is a bit sheer on the first coat but is opaque after two. A third coat deepens the colour slightly but isn't necessary. This really comes to life with topcoat. Below is three coats and topcoat. 'Pink Or Blue?' (LE) is a hot pink base full of a bright blue shimmer. It starts off quite sheer, but this really helps build up the shimmer. 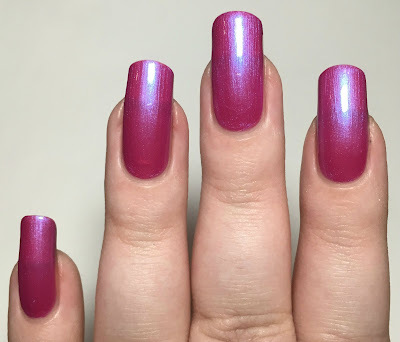 It applies smoothly and I found it to be opaque in three coats - you may be fine with two if you have a softer nail line.The combination of pink and blue together almost looks lilac-y in certain lighting. Below is three coats and topcoat. What do you think? Again I'm really impressed with every polish, not a single one has a bad formula! I keep changing my mind which one is my favourite, and I think picking four out of the seven would be a bit excessive - so I'll leave that down to you to decide! I can happily recommend picking up any (or all) of them. You can find the OccasioNail shop here. 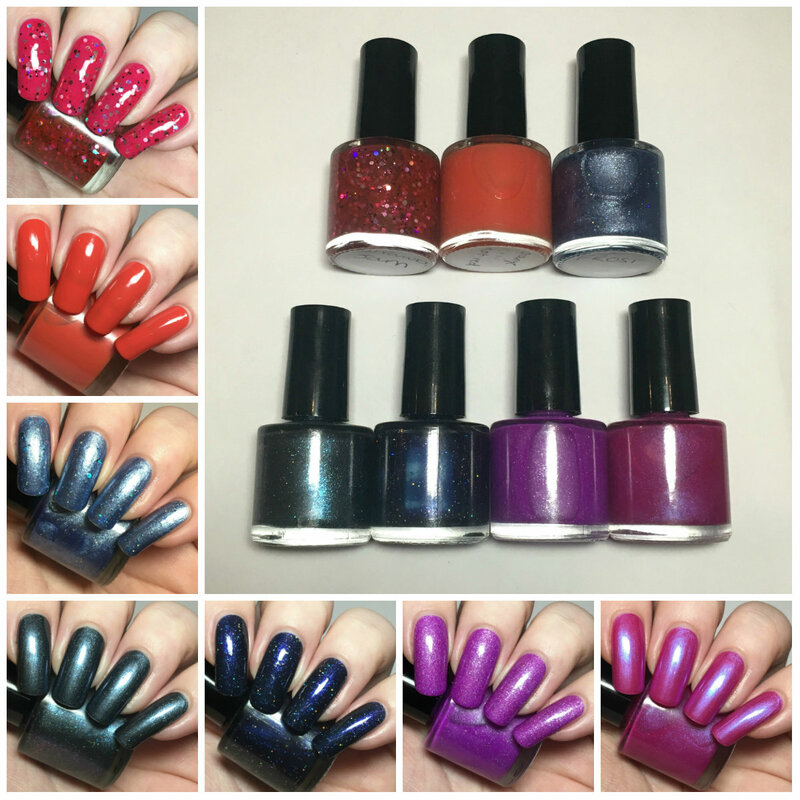 There is currently a sale with polishes for as little as £2.50! You can also find the brand on Instagram here and Facebook here. Your swatches are fantastic! I love Midnight Walk! Gorgeous swatches and polishes. OccasioNail is off to a great start! Ooh, Midnight Walk is like a galaxy in a polish! I also love the shades of purple! Beautiful swatches! 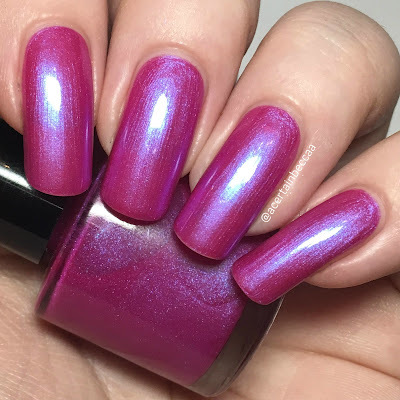 Such beautiful colours and your swatches are perfect! Such gorgeous colors! 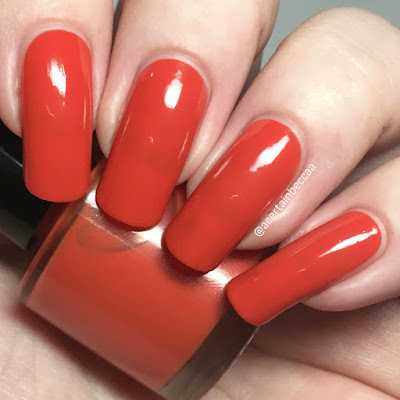 I adore the name and color for Orange You Glad It Isn't Red! I love Purple Panther and Pink Or Blue? Great swatches! Great swatches! I love that orange jelly! Yes! I am "Orange You Glad It Isn't Red"!! I love this type of deeper, almost burnt orange shade. So pretty! 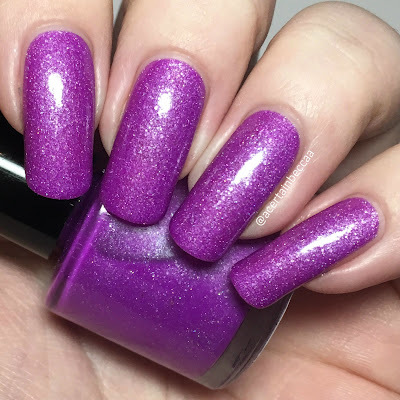 Purple Panther is so pretty - and I know I say this every single time I comment, but your nails are just perfection!